More than any other Scottish city, Glasgow gives its visitors a taste of the ‘real’ Scotland. Not only is it Scotland’s largest city but it is also its most eclectic, offering something for everybody. From friendly locals with a sharp sense of humour, to its fascinating centuries-old industrial heritage, to its now burgeoning restaurant scene and its vibrant and exciting nightlife, Glasgow is a city with energy. It is also a city with so much to see that the best way to fit everything in is by coach. 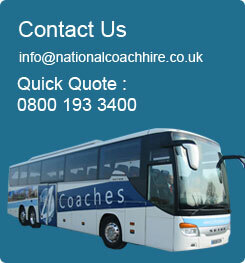 Whether you live in Glasgow and are looking for coach hire to anywhere else in the UK or you are organising a group trip or holiday to this exciting city, National Coach Hire can offer a relaxing, inexpensive and flexible service. If you’re looking for a coach service from Glasgow, we can source the best quotes from the best operators in the city; if you’re heading to Glasgow from elsewhere then we can offer coach operators with an in depth knowledge of the city and the surrounding area. Glasgow is a city that was built on tobacco and then shipbuilding, and a city that has bounced back from a long period of decline. It is a city that has changed so much over the last few years that it has been a constant award winner, from the European City of Culture award to being named UK City of Architecture and Design to most recently in 2008/2009 being named as one of the world’s top ten cities by Lonely Planet, citing ‘cocktails, cuisine and designer chic’ as defining the new Glasgow. With regards to architecture, the city is one of the most exceptional destinations in the United Kingdom, and trying to fit in all the different sights is where coach hire really comes into its own. When you are exploring a city with so much architecture designed by Charles Rennie Mackintosh it is hard to know where to start, from the Glasgow School of Art to the Scotland Street School, from the Willow Tearooms to the Queen’s Cross Church. But it is not just Mackintosh’s work that is worth exploring. Alexander Thomson’s buildings are also all across the city, from Holmwood House Villa to the St. Vincent Street Church. Finally there are the more modern buildings, such as the Scottish Exhibition Centre with the Clyde Auditorium designed by Norman Foster, and the new Museum of Transport to be designed by Zaha Adid. When you’ve had your fill of architecture the city also holds an impressive collection of art, from the outstanding Burrell collection to the Gallery of Modern Art, and, most impressive, the Kelvingrove Art Gallery and Museum – the most visited museum in the UK outside of London, (with one highlight being the spectacular Christ of St. John on the Cross by Salvador Dali). Whether you’re heading to Glasgow for the history or the arts, for business, or for the football at Ibrox and Hampden Park, coach hire really is the best way to fit everything in. And if you want to use Glasgow as a base and explore the outlying regions, whether they be Pollok Country Park or the Kelvin Walkway; or further afield day trips to the rival city of Edinburgh, or across to Stirling Castle or St Andrews; walking in the Trossachs or visit world famous Loch Lomond; wherever you want to go in Glasgow or Scotland, coach hire really is the best way to appreciate the stunning scenery and make the most of your time there.